Mi’kmaq communities and non-Indigenous allies have been actively opposing the completion of the Alton Gas project near Stewiacke, Nova Scotia. Alton Gas proposed to create four salt caverns in order to store natural gas underground, with the intention to build up to 15 more (they've since dropped two of the caverns). Once at peak brine generation, an estimated 10,000 cubic metres of brine will be released into the river each day until all caverns have been hollowed out (Hubley, 2016). The storage caverns are needed by AltaGas subsidiary Heritage Gas, which sells natural gas in the Halifax area and to utility Nova Scotia Power, which generates 22 per cent of its electricity from natural gas. Heritage Gas wants to stockpile its product during the colder months to protect its customers from price shocks when demand spikes. Alton Gas claims of savings for natural gas customers has always been disputed (Summers, 2016). Each of the caverns are expected to be about 80 metres high by 50 metres wide. The caverns would be linked to the nearby Maritimes and Northeast natural gas pipeline, about 60 kilometres north of Halifax (Macdonald, 2018). In the fall of 2014, construction started on a brine discharge pipeline despite the fact that the development had not yet received full government approval, and “it was met with swift protest. A camp was soon erected that was largely occupied by local Mi’kmaw protesters. For many, this was not only the first time hearing of the Alton Gas project, but also their first realization that components of their elected band leadership had known of the project for years” (Howe, 2016). In April 2016, Sipekne’katik and Millbrook First Nations, the Shubenacadie River Commercial Fishermen’s Association, The Council of Canadians and the Ecology Action Centre announced that they were each submitting Appeals to the provincial government “on grounds that Alton Gas provided inadequate research, has not considered impacts on local fish populations and groundwater sources and that the province has not fulfilled its duty to meaningfully consult with First Nations communities” (Hubley, 2016). The Sipekne’katik, Millbrook and broader Mi’kmaq mobilized to assert their treaty rights to food gathering and to defend “Water as Life” (Flier). In September 2016, the Mi’kmaw water protectors began watching Alton development site from a Treaty Truck House that they built along the banks of the Shubenacadie. The Treaty Truck House was built as a place from which to resist the project but it also serves to evoke the 1752 Treaty of Friendship and Peace which promised hunting, fishing, and trading rights in exchange for peace (Lewis, n.d.). and right to have a truck house is explicitly laid out in the 1752 Peace and Friendship Treaty (Treaty Truck House Against Alton Gas, n.d.). Mi'kmaw water protectors spent all winter in the truck house. And then on May 23, 2017, they set up a Treaty Camp along the entrance to the Alton Gas work site, effective blocking the company from working on the project. Since that time, they have built a strawbale house, a greenhouse, gardens, a chicken coup and other infrastructure at the Alton site, where Mi'kmaw water protectors live year-round. Resistance to the project is based on concern over ecological impacts including harm to fish, other wildlife and the river ecosystem. Indeed it is “against federal regulations in the federal Fisheries Act to deposit brine into a body of water where fish frequent” (Greenland-Smith & Poulette, 2019). There is also concern about increased greenhouse gas emissions from the natural gas production contributing to climate change (Hubley, 2016). “The resistance is also based on the project violating of Treaty rights and title of Mi’kmaq. Alton Gas has also not acquired consent from the Mi’kmaq Nation and their design knowingly violates the Treaty Rights of Mi’kmaq” (Greenland-Smith & Poulette, 2019), including their right to fish. Despite Alton's assertion that they have been consulting the Sipekne'katik First Nation since 2006, many band members say they did not hear of the project until Alton Gas started construction in 2014. “Residents were given little-to-no notice of any public meetings for hearing their concerns about the project, before it went ahead” (Hubley, 2016). “The government has indicated it has fulfilled its duty to meaningfully consult with First Nations about the project, in part because it acquired the approval of the Mi’kmaq Rights Initiative (KMKNO). However, both Sipekne’katik and Millbrook Nations have been polarized from the KMKNO over this issue, because they feel there has been no consultation. Despite their official appeals to halt the project until proper consultation has been followed through, the provincial government has given Alton Gas a green light (Hubley, 2016). Alton Gas says that plan has been put on hold because of “project and regulatory planning.” (Macdonald, 2018). The company has recently asked the Nova Scotia Utility and Review Board to extend its cavern construction permit to Sept. 1, 2023 (Cooke, 2018). Alton Gas has already drilled three wells at the Brentwood Road site and plans additional well drilling. The in- service date for cavern storage has been moved to 2022, a date Alton says reflects the time needed to complete the caverns (Campbell, 2019). 2006: Communications began between The Mi’kmaq Rights Initiative (KMKNO), Nova Scotia government and Alton Gas. This did not include proper consultation process. 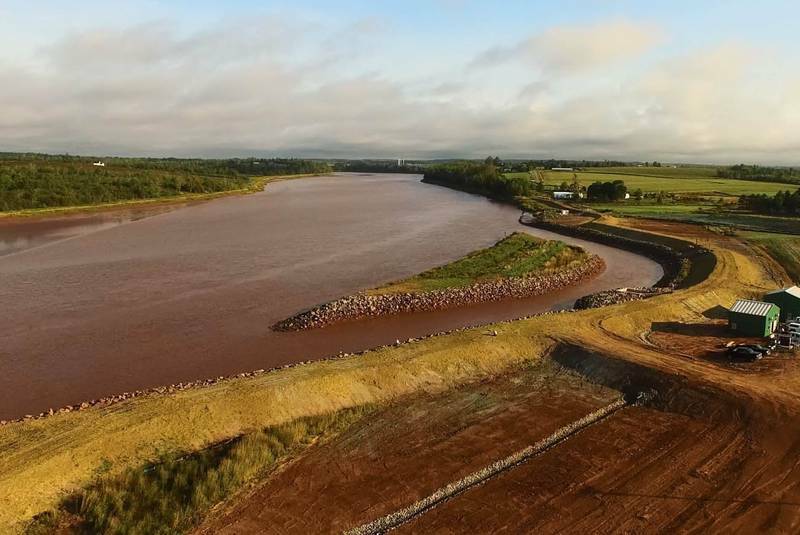 Fall 2014: Construction started on a brine discharge pipeline next to the Shubenacadie River (Hubley, 2016). Sept 2014: KMKNO publicly asserted that Alton Gas and the province had not yet fulfilled their consultative requirements and demanded the project cease until such obligations were met. The province declared the consultations complete and gave Alton the permits to continue its work (Hubley, 2016). February 2016: The Sipekne’katik band filed an appeal with Nova Scotia’s environment minister because of a perceived insufficiency in consultation with the band (Howe, 2016). At least eight others groups submit appeals to stop development on the brine release site (Hubley, 2016). March 2016: The project faces more opposition than ever (Hubley, 2016). September 2016: The Mi’kmaw water protectors begin watching Alton from a Truck House that they built along the banks of the Shubenacadie, near the Alton Gas brine dumping site. Sipekne’katik achieve a partial court victory in overturning the Provinces rejection of their appeal (filed in February). The provincial Supreme Court judge quashed the province’s rejection of the band’s appeal of the plan in January, saying the band was denied procedural fairness and ruled the province wrongly refused the band’s request to review and respond to reports on the project (Candian Press, 2017). May 2017: Treaty camp was built at the entrance to Alton’s worksite, to prevent Alton Gas from working on the project. Sept 2017: Mi’kmaq band awarded $75,000 in court costs. Fall 2017: Water protectors at Treaty camp (and allies) began building a strawbale house at the front gate with the intention to winter at the camp. Jan 2019: There are already three wells drilled at the Brentwood Road site, near Alton and Stewiacke, and Alton Gas plans additional well drilling (Campbell 2019). The in-service date for cavern storage has been moved to 2022 (Campbell, 2019)..
petition calling for its end (McShefferly, 2019). of Indigenous people (Tutton, 2019a). Indigenous land defenders are ordered off site, ending the 2 year occupation (Campbell, 2019). injunction against protesters on the Alton Gas property will be applied. But opponents dismissed the official “protest site” as a “play pen” in comments on the “Stop Alton Gas” Facebook site. Michelle Paul posted on Twitter, “There is no cage big enough to contain our treaty spirit” (Tutton, 2019b). Once at peak brine generation, an estimated 10,000 cubic metres of brine will be released into the river each day for up to 10 years or until all caverns have been hollowed out (Hubley, 2016). The storage caverns are needed by AltaGas subsidiary Heritage Gas, which sells natural gas in the Halifax area and to utility Nova Scotia Power, which generates 22 per cent of its electricity from natural gas. Heritage Gas wants to stockpile its product during the colder months to protect its customers from price shocks when demand spikes. Each of the caverns are expected to be about 80 metres high by 50 metres wide. The caverns would be linked to the nearby Maritimes and Northeast natural gas pipeline, about 60 kilometres north of Halifax (Macdonald, 2018). Company Names or State Enterprises Heritage Gas from Canada - AltaGas subsidiary, Heritage Gas, is interested in caverns for natural gas storage so it can stockpile its product. The Mi’kmaq Rights Initiative (KMKNO) (the organization which is the consulting agent for 12 of the province’s 13 Mi’kmaw communities) . Sipekne’katik is not a part of this. Development of Alternatives During the fall of 2016 Mi’kmaq opponents of the Alton Gas project, supported by non-Indigenous allies, set up a truckhouse along the banks of the Shubenacadie River near the Alton Gas brine dumping site. The right to have a truck house is explicitly laid out in the 1752 Peace and Friendship Treaty. During the fall of 2016 Mi’kmaq opponents of the Alton Gas project, supported by non-Indigenous allies, set up a truckhouse along the banks of the Shubenacadie River near the Alton Gas brine dumping site. The right to have a truck house is explicitly laid out in the 1752 Peace and Friendship Treaty. This has been a cite of mobilization and resistance as well as a physical and symbolic assertion of Mik'maq sovereignty. Mi'kmaq water protectors spent all winter in the truck house. And then on May 23, 2017, they set up a Treaty Camp along the entrance to the Alton Gas work site, effective blocking the company from working on the project. 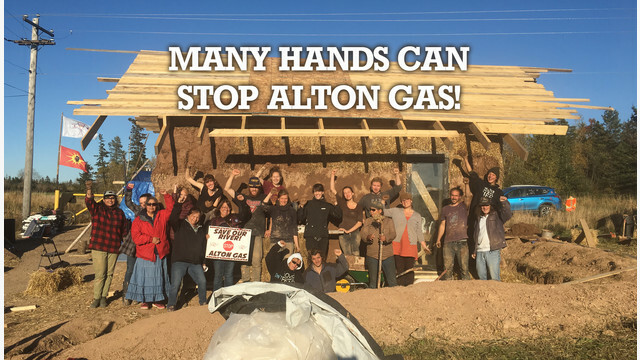 Since that time, they have built a strawbale house, a greenhouse, gardens, a chicken coup and other infrastructure at the Alton site, where Mi'kmaq water protectors live year round. This case is a beautiful example of the strategy of "putting the solutions in the pathway of the problem". Groups resisting the projects have cited Bill111 to argue again the development. It is an act to address environmental racism in Nova Scotia. (Hubely, 2016). In March 2019, Mi'kmaq matriarchs serve an eviction notice to Alton Gas, enacting Mi'kmaq sovereignty in the face of state and corporate violation of their rights..
Why? Explain briefly. The project has been significantly delayed and continues to be delayed. Final outcome is yet uncertain. Resistance to the project has created new alliances and networks of mobilization. The importance, in fact legal duty, to consult First Nations has been underscored and strengthened. New forms of resistance - material and symbolic - have been forged at the Resistance camp. (Summers, 2016) "Alton Gas Refuses Public Examination of Consumer Savings Promise". Halifax Media Co-op. (Canadian Press, 2019) Alton Gas goes to court to remove protesters from work site. CBC News. (McSheffrey, 2019) Mi’kmaw matriarchs serve eviction notice to Alton Gas. Global News. (Campbell, 2019) Alton Gas protesters ordered off site, ending two-year occupation. Chronicle Herald. (Tutton, 2019b) Opposition to Alton Gas get small designated zone for ‘peaceful protest’. Global News. (Tutton, 2019a) Nova Scotia court grants injunction against Mi’kmaq protester at Alton Gas site. Global News. 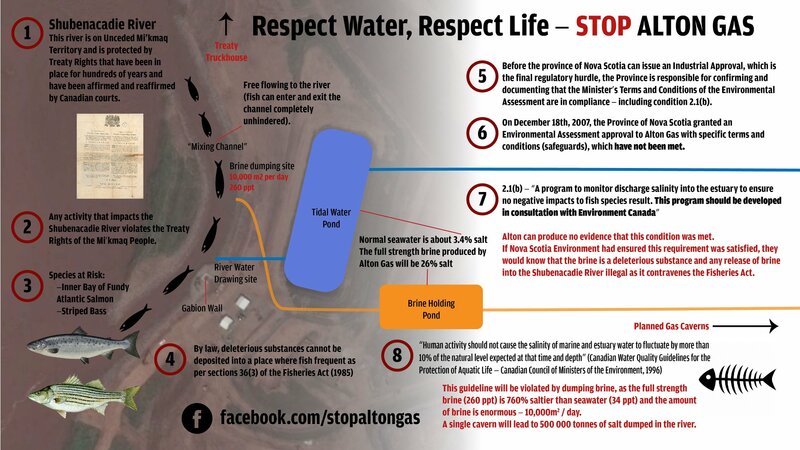 Alton Gas Figure Figure from open letter "PSA: Respect water, respect life − Stop Alton Gas"